"Venetian Plaster" is a decorative polished lime or resin plaster. It is also called "Decorative Stucco" or "Italian Plaster." Some people refer to it as a "faux finish," but real Venetian Plaster is actually plaster. True Venetian plaster is a mixture of aged slaked lime putty, sand, finely ground marble dust, and pigment applied with skill results in a warm effect reminiscent of Tuscany. Some people prefer colored plaster over Venetian plaster because it has a much more natural look, with random variations in tone. No two walls will look exactly the same. Pigment can be added to conventional or veneer plaster. Both Venetian plaster and colored plaster are high-end alternatives to ordinary paint finishes or wall coverings. Plaster is a durable and long lasting surface. The finishing treatment determines depth and sheen. Venetian plaster can be burnished to a glass-like, high gloss marble look. It can also have a smooth or rough matte finish or a distressed stone look. Colored plaster is also polished with a trowel, and can be waxed or sealed for a shiny look. It is thicker than Venetian plaster. Plaster can be tinted to any color. Popular color washes or pigments include terracotta, Provencal blue, ivory, and pale green for a Mediterranean look. When applying Venetian plaster, the first layer is applied as a skim coat, which is then covered with translucent layers of plaster. A topcoat compatible with the plaster brand may be applied. This adds durability and moisture resistance desirable for bathrooms and traffic areas. A thin coat of paste wax may also be applied to achieve sheen and protection. For both Venetian and colored plaster, finished surface of plaster is more durable than drywall, and will not knick. Even though it's usually less than 1/8" thick, it feels like a layer of stone. It is mold and mildew resistant. Once sealed, the colors should not fade. Avalanche Plastering always puts up a basecoat that provides a good surface before doing a Venetian plaster finish. We do not install it right over sheetrock due to concerns that it screws can pop out and tapes could lift. 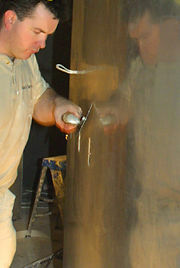 Please contact Avalanche Plastering if you'd like a quote for applying venetian plaster to new or existing construction.